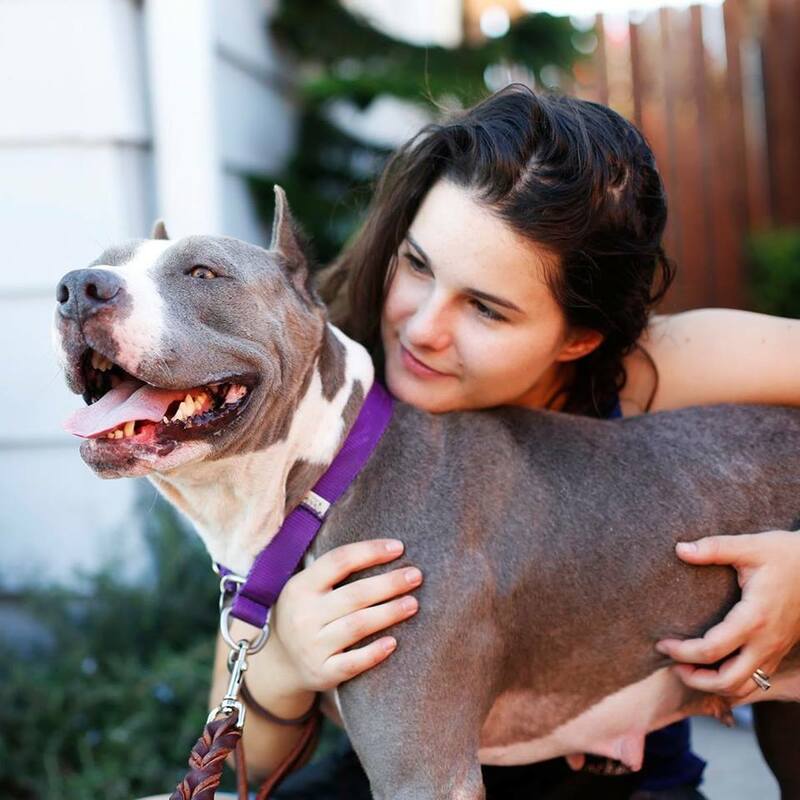 If you've ever fostered an Angel City Pit Bull, you already know Mackenzie--and even if you haven't, you've probably seen her around our pack hikes, adoption events, and Jefferson Park shifts. 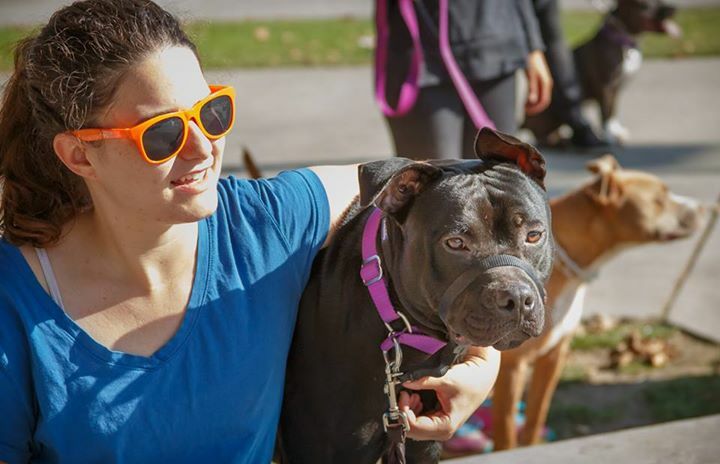 As one of our foster coordinators, Mackenzie manages the logistics of all things foster dog: vet appointments, foster home shuffles, questions from foster parents, and more--and all as a volunteer! We caught up with Mackenzie to learn more about her years of volunteer work with ACPB. When and how did you first get involved with ACPB? I first got involved with ACPB by fostering dogs in 2014. I then joined the core team as a foster coordinator in 2015. What do you do as an ACPB volunteer? As a volunteer, I help out wherever I can for the dogs! I attend pack hikes, adoption events, training classes, care for the dogs at Jefferson Park, and chauffer the dogs around town. As a foster coordinator, I help get dogs settled into foster homes and offer support to families as they care for their foster dogs and help prepare them for adoption. What has been the best part of fostering? The most challenging? Including my current foster dog (Buddy) I have fostered 127 dogs! The best part of fostering is getting to know each dog as an individual; they all have such different personalities and after each one is adopted I get a new one! The most challenging part of fostering is the occasional urgent bath and clean up when a dog isn't feeling well and gets diarrhea. What's been the best part of volunteering? The most challenging? Being able to help lots of different dogs in the program and seeing them all get adopted into loving homes is the best part of volunteering with ACPB. The most challenging? Keeping track of all the dogs! I try to meet all of the dogs at Jefferson Park before they move into foster homes so it's easier to remember each name and face. What would you say to someone who's on the fence about fostering a dog? Start slow--you can foster a dog temporarily, for a weekend or even just 1 night and see how it goes! What do you think makes someone a good foster parent to a dog? A good foster parent is anyone who is willing to meet each dog where they are. Every dog will have different needs. Whether it's potty training, leash work, socialization, or just giving them a quiet home to decompress from the stress of a shelter environment, foster parents play a crucial role in preparing dogs for adoption. Being a foster coordinator is a lot of work--what keeps you going? ACPB is made up of a team of devoted dog (and kitten!) lovers, so knowing that I'm supported by a great team keeps me going! What has been your most memorable ACPB moment? The first time I helped bottle feed a litter of puppies, it was cold in the room and I stuffed half a dozen puppies inside my sweater to keep them warm! Thank you for everything you do, Mackenzie! To sign up to volunteer, fill out an application today. And if you'd like to give fostering a try, we'd love to have you.